Fair. In acceptable used condition. Tanned pages and cover. Creasing and bumps to cover and spotting to page edges. folding to corners of cover and pages. Knew it was a good book anyway - a superb read - but this lovely copy arrived exactly as described, in great condition, on time - very happy indeed. 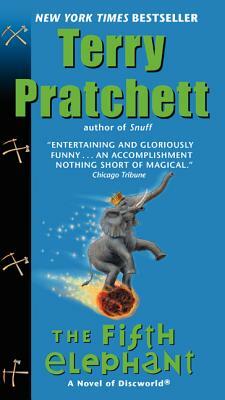 Pratchett enters the misterious world of the dwarfs when Vetinari assigns Vimes to be ambassador of Ankh-Morpork. One of my personal favourites, The Fifth Elephant is another great crime story full of misteries and tension. If you like Sam Vimes and the Night watch, this is a must!